Apr 2, 2017: Long Beach Yacht Club - The finals are complete, and the new red blazer champion is crowned after a heated five race, down to the wire finals. Apr 1, 2017: Long Beach Yacht Club: The final four were determined today as Taylor Canfield, Johnie Berntsson, Phil Robertson and Ian Williams move on. Mar 31, 2017, Long Beach Yacht Club: Berntsson, Canfield, Robertson and Sam Gilmour are joined by the four top teams from the repechage completed today as the quarter finals start tomorrow. 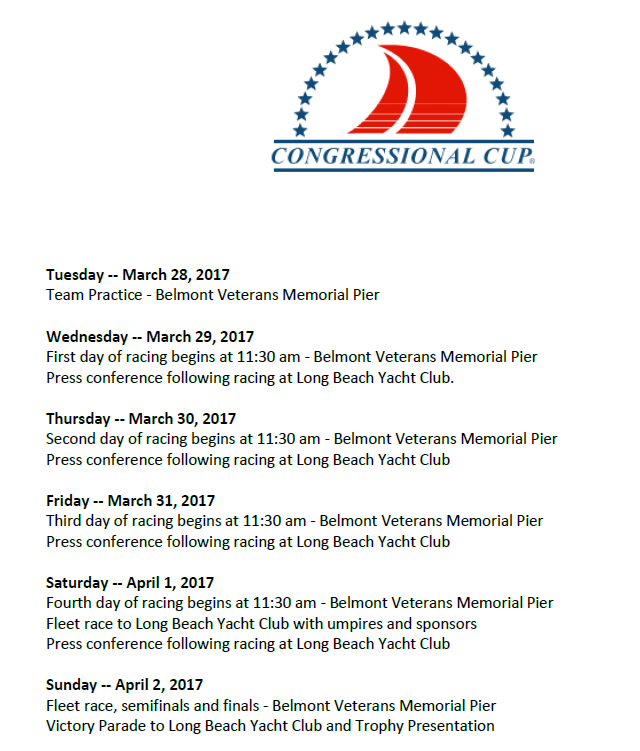 Mar 30, 2017: Long Beach Yacht Club: A second day of racing is complete in front of the Belmont pier as the top four teams have been established. The Congressional Cup is one of the most respected trophies in match racing history. In 1963, the goal of the Congressional Cup founders was to create an annual, world-scale regatta that would run over a short course with intense action, and offer a competition that would be a true test of skill by using equal and identical boats. The first regatta was held in 1965. Through the years, Congressional Cup has attracted an increasingly impressive following of internationally renowned skippers and crews – including many America’s Cup participants – have sought an invitation to the regatta. Now in its fifty-third year, Congressional Cup is back as the only monohull event on the World Match Racing Tour. Apr 2, 2017: Race Day 3. The final day brought light breeze and the fleets got only one race off before the wind died down completely. Published Apr 2, 2017: Day 2 video includes sweeping views of the British Virgin Islands and the Caribbean Sea. Follow the Bareboat fleet out around some of the most beautiful islands in the world. The BVI Spring Regatta & Sailing Festival has the best of all worlds: weather, competition, parties, culture. BVI Spring Regatta and Sailing Festival: "The BVI Spring Regatta and Sailing Festival is one of the largest regattas in the Caribbean. The aqua waters around the British Virgin Islands in the northern Caribbean, attracts over 100 yachts and sailors, friends and families from around the world. The pride of excellence of a well organized regatta, with international race officers and experienced committee members to ensure the best racing in the world. With 18 classes and three race areas allows all participants exclusive races depending on wind, waters and conditions. Racing in three bodies of water; the main Sir Francis Drake Channel, the Caribbean Sea and the Atlantic Ocean, surrounded by over 60 islands, give the race committee a variety of windward/leewards and around island races to choose from." Video above published Mar 22, 2017: There are countless things to love about the Home of the 35th America's Cup. As we get ready for an incredible summer of racing in Bermuda, we spoke with locals about their favorite things about the island. Top of the list was the beautiful beaches, gorgeous blue water and hospitality of Bermudian people. The America's Cup is without a doubt the most difficult trophy in sport to win. In the more than 150 years since the first race off England, only four nations have won the "oldest trophy in international sport. Video above published Mar 17, 2017: Here are seven sailing tips and boating safety techniques you can use aboard any boat--sail or power--anywhere in the world! Captain John with 25+ years of experience shows you the no-nonsense cruising skills you need for safer sailing worldwide. Visit http://www.skippertips.com for more boating safety tips. Video above published Mar 22, 2017: The season opener of the 2017 Extreme Sailing Series™ saw four days of heated battle in Muscat, Oman, with multiple lead changes and plenty of drama, before SAP Extreme Sailing Team emerged champions of Act 1. Watch episode one of the official 2017 TV Series here to re-live the action before we head to Qingdao next month. WMRT Match Cup Australia: Highlights of the Super 16, Quarter, Semi and Finals! Mar 25, 2017: Take a look at the best action out there on the water during the Super 16's, the Quarter Finals, the Semi Finals and then into the Finals, where we saw Phil Robertson dominate and take home the winning title! Simon Shaw Wrap up Final's day! Mar 25: Simon Shaw wraps up what turned out to be a very eventful week! With tour card holders knocked out early in the running, it was really a locals game, until 2016 World Match Racing Tour Champion Phil Robertson showed the other contenders how its done! Streamed LIVE Mar 25, 2017: The final day of the Match Cup Australia. Mar 23, 2017: As we move forward into the Quarter Finals, take a look at the best parts of the final day of the Super 16 rounds! 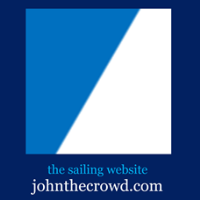 World Championship event, fleet and match racing competition. Monday to Wednesday, fleet racing in the M32 high-performance catamarans. Racing begins at 10am (local time) and continues throughout the afternoon, weather dependant. 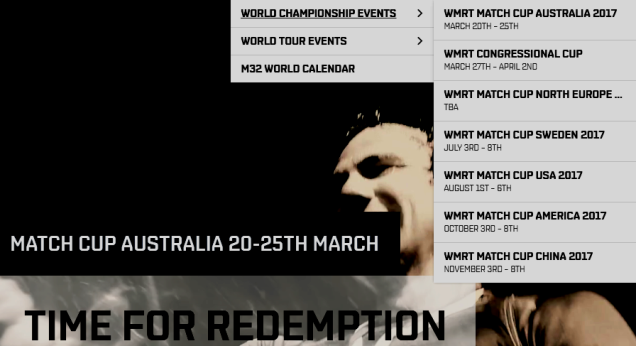 Click here to view the WMRT event page, list of tour card skippers and qualified teams. Venue Report – Royal Freshwater Bay Yacht Club | World Match Racing Tour: "Royal Freshwater Bay Yacht Club, affectionately known around the world as “Freshie”, has a stunning location on a promontory above the Swan River, which provides a natural amphitheatre ideally suited to stadium sailing. As hosts of the World Match Racing Tour events Perth Match Cup and Match Cup Australia, rest assured that Freshie will deliver." World Match Racing Tour March 18th, 2017: Local skipper Steve Thomas and his RPM Racing team made a clean sweep of the Perth Match Cup, winning every race and confirming his qualification for this week’s Match Cup Australia, the first championship level event of the 2017 World Match Racing Tour. Video above published Mar 10, 2017: An underwater heat wave has devastated swaths of Australia's Great Barrier Reef for the second consecutive year, threatening fragile corals along hundreds of miles of the country's tropical coastline, marine researchers have found. Published Mar 8, 2017: Palau's vibrant corals are thriving, despite some of the warmest and most acidic waters in the world. In this virtual reality experience, Lukas Isall from the Palau International Research Centre explains how unlocking the mystery of Palau's corals might help in the fight against climate change. The Oceans series examines the cutting edge science and radical thinking at work in tackling the crisis facing the world’s seas. This series reflects the passion of those at the frontline of marine biology, and tells the story of the challenge now confronting us as we explore the world’s oceans. Video above published Feb 27, 2017: A walkaround of Hanse's bold flagship, the 675, from the Dusseldorf Boatshow 2017. Video above published Feb 28, 2017: Elaine Bunting talks to Sir Russell Coutts about Emirates Team New Zealand's pedal power and preparations for the America's Cup in Bermuda. Published Mar 4, 2017: Watch the 2017 America's Cup Class boats practice in Bermuda's Great sound. The World Match Racing Tour (WMRT) is the world's leading match racing series featuring World-Class Championship events across the globe. The series is sanctioned by World Sailing with "Special Event" status. Video above published Mar 10, 2017: The Rolex Swan Cup is the ultimate opportunity to experience the luxury and high performance of Nautor’s Swan yachts. Every year the race location alternates between organizer Yacht Club Costa Smeralda’s two prestigious club locations – Sardinia’s north-eastern Emerald Coast and Virgin Gorda in the British Virgin Islands. The 2017 Rolex Swan Cup Caribbean featured ideal weather conditions and spectacular racing by the international Swan fleet. Both class winners took home a Swan Cup Caribbean trophy and a Rolex timepiece. If you've ever had a desire to turn back time and sail the waters of Lake Michigan aboard a ... Sailing on a traditionally-rigged vessel is rewarding. Swapping autumn for winter, meet Charles Webb, the Aussie adventurer whose about to take on Russia and Antarctica. Published on Feb 27, 2017: "Two old salts and me sail to Cuba with several cameras to document her as she breathes now before diplomatic relations inevitably alter this time-capsuled country forever. The reasons we fell in love with Cuba are the exact reasons why it will have to change since the influx of Yankees won’t want to drive a rented rusty sedan, stay in someone’s house or eat in someone’s living room like we did." Video above published Mar 11, 2017: Watch the best moments from the epic final day of racing in Muscat, which saw the nine GC32s battle in winds of up to 25 knots in six nail-biting races. Muscat delivered classic conditions in an electrifying finale to the opening Act of the Extreme Sailing Series™ that saw SAP Extreme Sailing Team become the first winners of 2017. More at JohnTheCrowd | Sailing News: 2017 Extreme Sailing Series Act 1, Muscat, Oman, March 8-11, 2017. Video above published Mar 9, 2017: Watch the #bestmoments from day two of the Extreme Sailing Series™ in #Muscat, which saw local team #TeamOmanAir finish on top after a heated battle with yesterday’s champions @sapextremesailing. Above video published Mar 8, 2017: Check out the highlights from the first day of racing at the 2017 Extreme Sailing Series™ season opener. The fleet of nine one-design GC32 catamarans competed in seven open water races off the coast of Muscat’s Old Town and Danish-flagged SAP Extreme Sailing Team emerged at the top of the leaderboard. Video above published Mar 12, 2017: A fitting finale to a thrilling week of top-class racing. Next stop: Tuscany for the Rolex TP52 World Championship SCARLINO 2017. Stay tuned. Racing starts again on 16th May. The 52 SUPER SERIES moved to South Beach for the 52 SUPER SERIES Miami Royal Cup. Racing started Tuesday, 7th March, and there was NOWHERE TO HIDE: The final three days of racing were streamed LIVE via 52 SUPER SERIES TV, powered by Quantum Sails​. Follow the 52 SUPER SERIES for all the action. All times stated are local times. Times are subject to change every day. For the latest developments, check Twitter (feed embed below). Video above published Feb 27, 2017: The 2017 RORC Caribbean 600 started in magnificent conditions with the largest ever offshore fleet assembled in the Caribbean enjoying sparkling conditions. Close to 900 sailors from 30 different nations competed in the 9th edition of the Royal Ocean Racing Club's classic offshore race. Olympic medallists, America's Cup winners and round the world sailors competed alongside passionate corinthians on the same 600 mile race course around 11 Caribbean islands, starting and finishing in Antigua. The 2017 edition will be remembered for highly competitive racing throughout the fleet, with American yachts winning the major prizes. The race was affected by unusual weather conditions, with a low pressure system sending the wind direction spinning through 360º of the compass. The most anticipated multi-class regatta in Miami took place from March 5th to March 11th, 2017. Teams representing countries from all over the world will meet again and line up under Miami's sunny skies on Biscayne Bay to compete for the celebrate Bacardi Cup and the BMSW regatta trophy. The Star Class competed for the 90th time in the Bacardi Cup, the VIPER 640 in their EFG Pan-American Championship, the J70s and the VX Ones for their 3rd and 2nd year. Video above published Mar 3, 2017: Olympic Bronze Medalist Caleb Paine (San Diego, Calif.) and IKA Formula Kite World Champion Daniela Moroz (Lafayette, Calif.) were selected as US Sailing’s 2016 Rolex Yachtsman and Yachtswoman of the Year. They were honored on March 2, 2017 at the New York Yacht Club in Manhattan for their accomplishments. Video above published Feb 15, 2017 by US Sailing: Hunt and Betsy Lawrence (New York, NY) received the prestigious Nathanael G. Herreshoff Trophy for their outstanding contributions to the sport of sailing. The Lawrences were instrumental in their financial support for the fleet of Olympic-class boats that were used at the Olympic venue in Rio for over two years to help train American athletes. Having access to these boats provided an important edge for Team USA as they prepared for the 2016 Rio Games. Video above uploaded Dec 18, 2011: Oakcliff Sailing Center offers the only comprehensive program that teaches sailors on the water, in the shop, and in the front office. "We're raising the next generation of American racers." Oakcliff, a high performance training center, was founded by the Lawrences in 2010 and was named a US Sailing Team National Training Center in 2013. Oakcliff acquired multiple fleets of these Olympic-class boats that were used for training and racing in Oyster Bay and around the world. These boats were also used around the country for Olympic Development Program camps over the past two years, and helped many top youth athletes train and expand their skills. Video above published Feb 27, 2017: Find out just what it takes to race on one of the most competitive one-design racing circuits in the world as we recap the highlights from 2016 - the most competitive season in RC44's 10-year history. More info: americascup.com and here. Above video published Feb 24, 2017: The Chinese team's boat is the first to be handed over ahead of the Volvo Ocean Race 2017-18 edition following the one million euro re-fit process at the Boatyard in Lisbon.